I was lucky enough to recently get a Biscaya Vis a Vis on eBay for a bargain price. No bedroom compartments in the deal, but that doesn't matter to me - I much prefer my camping to be open plan. I've owned other fabulous Cabanon tents in the past, but this model is in a league of its own! It has just shrugged off 2 weeks of Cornish weather - ferocious wind, pelting rain, hot sun - with absolutely no problem. It took me just 40 mins to pitch and about the same to pack away. Plenty of ventilation to cool things down on the hottest days, but then everything zips up tight to keep you cosy on the cold, windy days. Solid as a rock with zero canvas flap. Loved the big open porch - makes the tent look really welcoming. The central pole arch, which zips into a channel alongside the small door (when that is all you want to be open), swivels to the side when you want the whole front to open up, leaving a lovely wide opening. This is a tent that gets noticed - and for all the right reasons. We have had this tent for a year now and its fantastic. We have had very bad weather on more than one occasion and there has never been any problem or concern with it, especially when the wind has been very strong. We have just bought the sun canopy for it which is useful. Its a fact that you get what you pay for. We bought a new Cabanon Biscaya Vis a Vis, as we liked the bedroom layout (3 x separate inners; one double, one big enough for 2 single airbeds and a huge one opposite, which can easily accommodate a 5ft double high airbed and all our stuff) yet all within a relatively small footprint, so no worries about pitch sizes. It is relatively easy to pitch (though has five internal poles, which was a bit of a surprise) because, at just 3.2m wide, it is easy to lift the poles into position without a struggle (had the Biscaya 500 last year and it was deffo a 2 man job). The fixed side porch is excellent; not so high that it catches the wind but not so low that you have to duck! We have an optional sun canopy, which is quick to attach and provides a useful area for dining and / or sitting. No dedicated EHU entry point (surprising, since the 2006 model Biscayas did) but most of the pole sleeves zip up in sections, which makes life easier. The living area is not huge, but nicely adequate and very light and well ventilated (windows front and back, with mesh panels). The ZIG made for a cozy interior in some truly awful weather conditions and the Outwell Minnesota 4 carpet fits with just a modicum of folding under at one side, which makes it nicer underfoot. 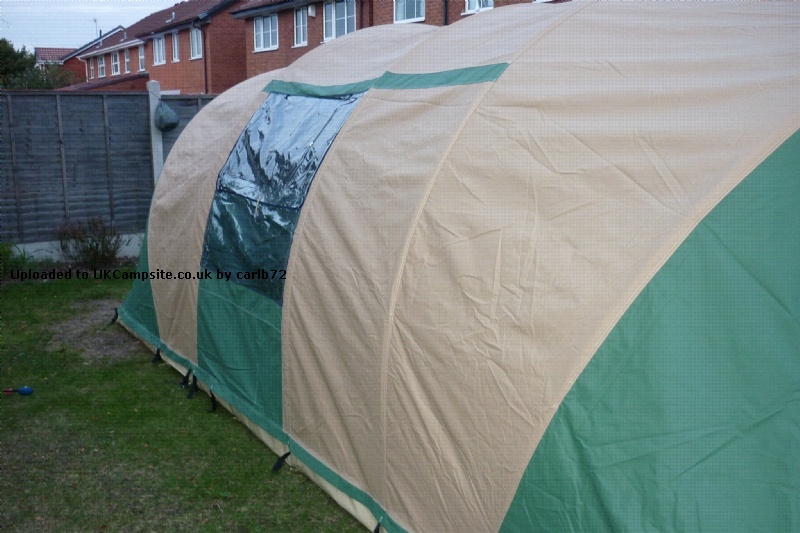 A couple of niggles: the front of the tent zips to one side, which is excellent for ventilation on those warmer days, yet the pole near the door does not have a roof sleeve, hence when the front is out it is is only supported by the pole sleeve on the rear wall and so the pole effectively slips. Not major, but an additional roof sleeve would have remedied this (or even an additional tie, near the door). Despite every website image and the Cabanon catalogue showing this tent with mud flaps to the porch area, there aren't any! I queried this with the retailer (as we only discovered when we pitched it) and then discovered that Cabanon have decided to do away with the mud flaps on all Biscaya models now off the production line but have negleted to inform their retailers of this small fact! I am informed that there is a disclaimer on the rear of all Cabanon brochures, stating that they may change spec without notice. Still, I'd have liked this info prior to purchase. All in all, we are very happy with this tent. 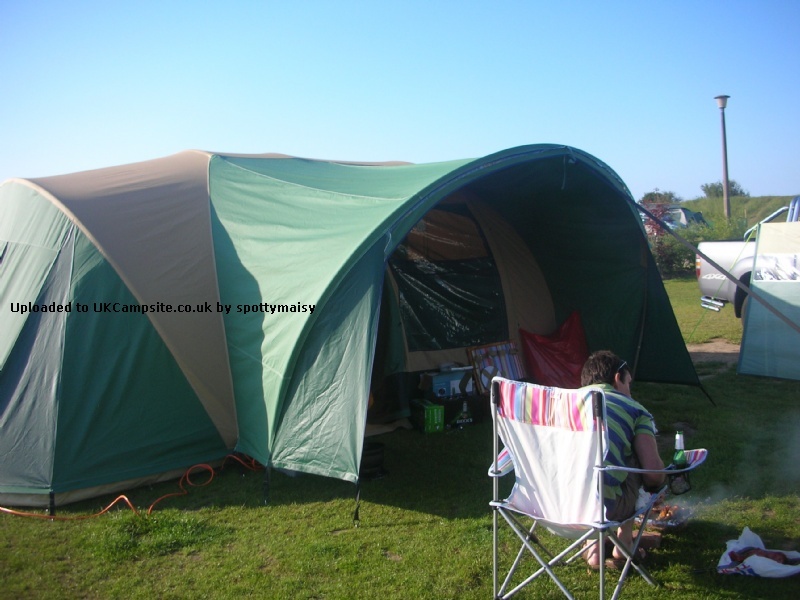 Typical Cabanon quality makes this sturdy and robust and inspires confidence - we have used this tent in the worst gales - using Delta pegs on the front guy straps - and it didn't budge. It doesn't take long to pitch and is an economical use of space; a family tent without a huge footprint, which was of major importance to us. 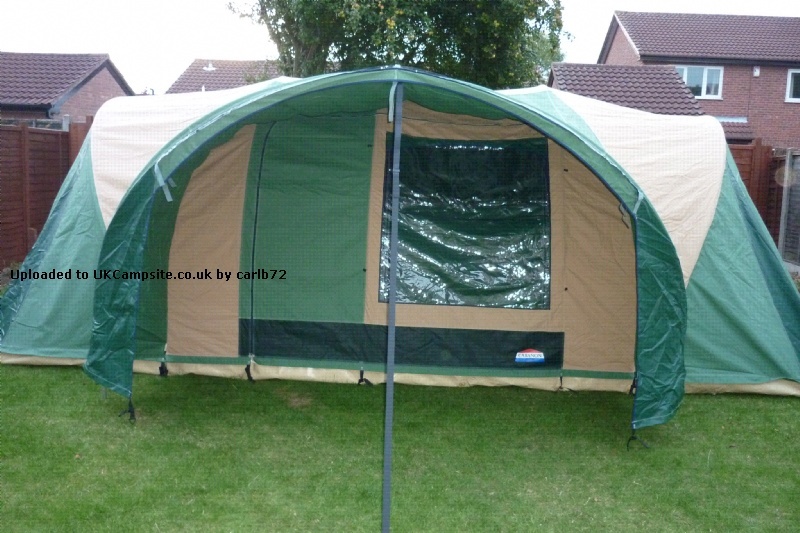 We cannot praise this tent highly enough.Yes the RRP of about �1400 is a bit frightening but there are deals to be had. 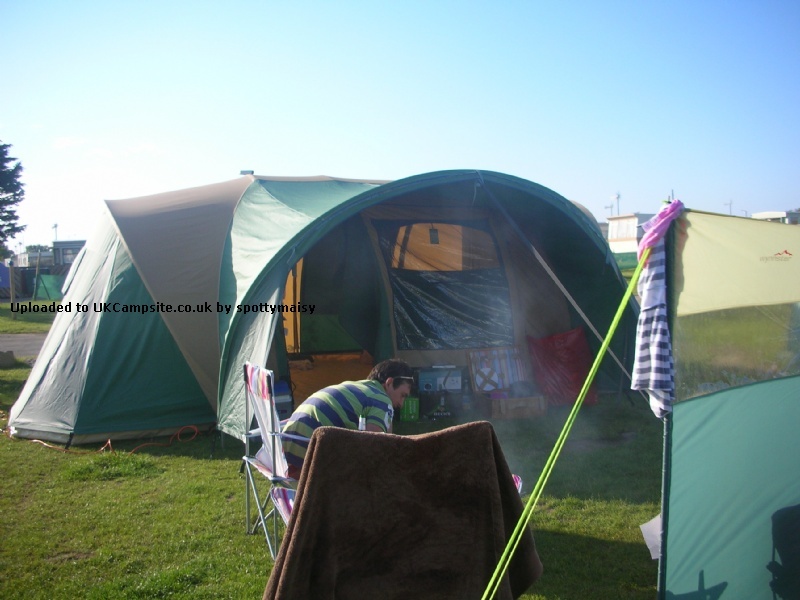 Fortunately our local Crowland camping and caravan centre are very nice and helpful people. 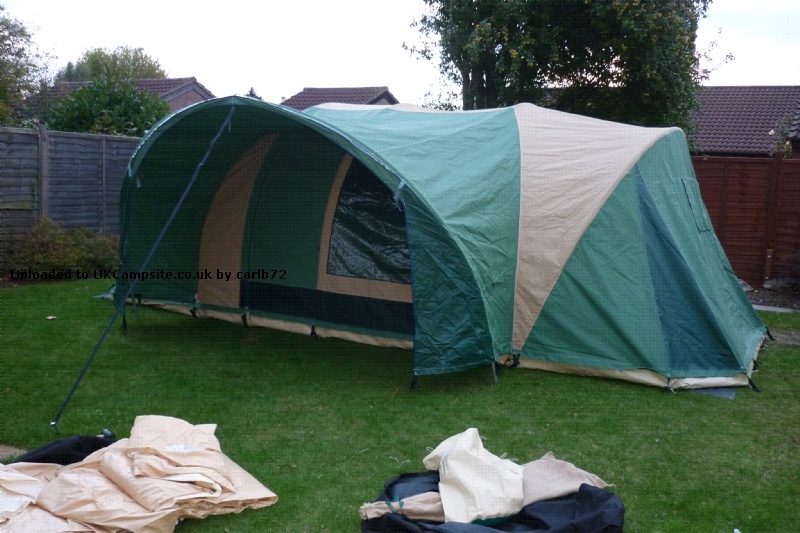 Suffice to say both my wife and I like a bit of space and height and wanted a durable tent that would be easy to pitch and allow us to have family and friends stay over when the need arises. (usually after a boozy barbecue!). 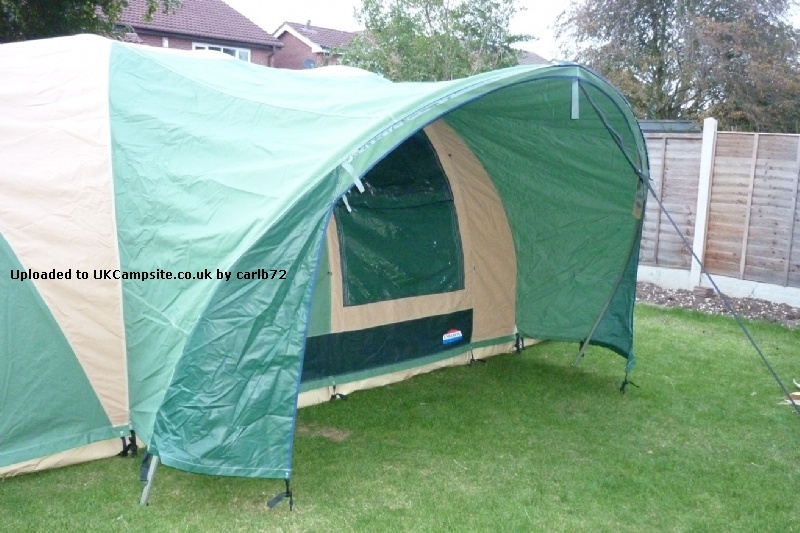 Having owned a couple of much cheaper tents we were initially staggered by the price difference.HOWEVER once you actually way up the benefits of a very high quality and long lasting bit of kit made from 220g/m2 ALL season polyester over some semi transparent skin tight nylon tent combined with its VERY easy and quick fly first pitching. If you can do a deal and stretch to one then it is the business! It is warm, draughtproof, watertight, cosy, strong, easy to cool down with its roll away front and other vents. All the six semi circular elasticated sturdy alloy frame sections( I think 28mm) are identical.No mix ups here! Just peg down the groundsheet lay in the assembled poles throw over the fly, zip that to the groundsheet stand up the individual frames and zip them into the channels in the tent (except the front porch one which slides through and is erected first). My wife and I can erect this all in about 40 minutes without hurrying. That does not include the inner compartments but it IS the important bit especially if the weather is unsettled! Very few external guy ropes but you do need about 20 square feet of space to fit it into! Once it is up you will be amazed by its strength and presence on the camp site! It has made our long weekends an absolute pleasure.As someone once said.The quality remains long after the price is forgotten! Or something like that! I am not normally a great fan of the French but I do take my hat of to the staff at CGI Camping (Cabanon)! Top Marks! Add your review of the Biscaya Vis a Vis! Using the clever Cabanon Biscaya frame system, the Vis a Vis is a very spacious and strong family tent with three generous bedrooms and a durable zipped on groundsheet - ideal for the larger family.